It is very important for us and our customers that the products bought in our Antonio Mata shops, such as sausages, fresh meat and cured ham, is preserved as long as possible. Therefore, for a long time now, we have been going to the best plastic and paper bag manufacturer in search of a solution that provides us with all the advantages. Papeles El Carmen, located in Alzuza, Navarre, with a long tradition and prestige in the sector, especially for its policy of using materials and techniques that respect the environment, informed us about its new bag, the Sacovitta vacuum pack. 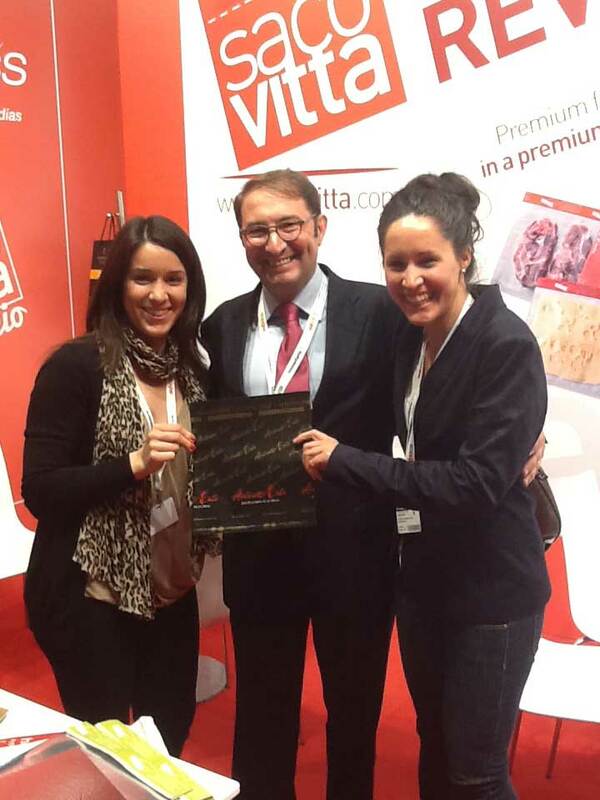 At Alimentaria 2012, held in Barcelona from 26 – 29 March, we were also with Manuel Santos, Sales Director at Papeles El Carmen, seen in the photo next to Belén and Chelo, part of the Mata family. Long-lasting preservation under vacuum: thus, the food maintains its nutritional properties, flavour, odour and texture without the aid of chemicals, making it much healthier. Lengthens the shelf life of foods by over 8 days, and is resealable: Once opened, it can be opened and closed several times. Prevents liquids from spilling out of meat packages: we have all experienced that occasion when you get home and liquid has leaked out of the plain paper wrapping. The packaged product can be frozen directly from the shop. In addition, its horizontal shape makes it easier to organise in the refrigerator. It is very practical, as one side is paper, for dates and other information; while the other side is clear plastic, so we can easily identify its contents. As always in Antonio Mata shops, we want to offer our customers the best: the best products in the most practical, convenient, clean packaging, which preserves food better.